Q. InfraCOOL® Technology – what is that? A. InfraCOOL® Technology by Dulux® works by targeting the invisible INFRA-RED portion of the sun’s energy which accounts for around 50% of the heat energy hitting the surface. Even dark colours can be made cooler. Q. How does Cool Roof work? A. 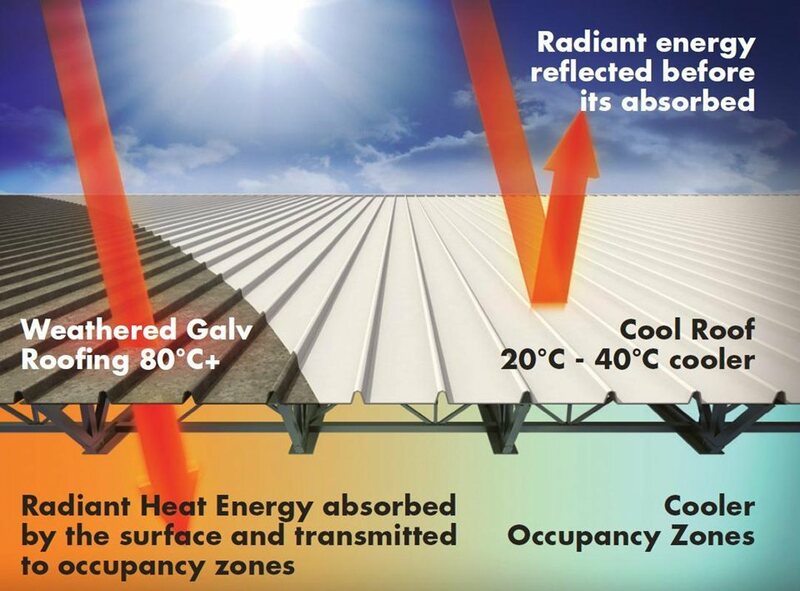 Cool Roofs reflect maximum amounts of the sun’s light energy and light is reflected as light, NOT heat and hence the effect of reducing the build-up and storage of heat in urban environments. The reason we see the colours we see is because certain portions of the visible light spectrum are either absorbed or reflected. White reflects almost all visible light and black absorbs almost all visible light, which is why dark surfaces are naturally hotter than light ones. The visible light makes up only half of the total light energy. The other 50 per cent (mainly invisible infrared) is largely ignored in conventional products. With Cool Roof, the temperature of the surfaces can be reduced by 20 and 40 percent translating into cooler occupancy, lowering cooling energy demand which delivers both cost and carbon emission savings. Q. So how much cooler is Dulux® Cool Roof? A. It varies dependant on the colour choice, building structure & air movement. For a typical Dark Grey-Black roof a surface temperature difference of 10-20oC can be demonstrated which translates into less heat flow into roof & living spaces. Q. What are the benefits of using Dulux’s heat reflective coatings? Improve occupancy comfort – Tenants will enjoy cooler and more pleasant living or working conditions. Q. How is the product applied? A. Commercial Roofing – 2 coats of one primer and one topcoat over properly galv-zinc roofing via airless spray. Residential Roofing – 1 primer and 2 topcoats applied over properly prepared concrete tiled roofs or iron roofs via airless spray. Q. Will it extend the lifecycle of my roofs? A. InfraCOOL® Technology can be applied to galv-zinc metal or concrete tiles in commercial or residential applications in protective membrane systems, extending the roof life cycle by 10+ years. Q. What colours are available with InfraCOOL® Technology? A. Dulux® InfraCOOL® technology is an option for most colours across the AcraTex® Roof Membrane colour range. Additionally Dulux® has formulated comparable colour matches to most popular Colorbond colours. Some colours benefit more than others from InfraCOOL® Technology. Refer to the InfraCOOL® colour range charts for confirmation of availability and performance potential. Q. Is this technology available in other Dulux ranges? A. Dulux® can also deliver InfraCOOL® benefits through its range of AcraTex® elastomeric wall coatings, reducing heat penetration into buildings and lessening the thermal stresses on concrete and lightweight facades. (1) Cooling Energy saving and (2) Carbon offset potential based on independent Cool Roof Case studies and research by Lawrence Berkeley Heat Island Group.